German brand Kennel & Schmenger is without a doubt one of my favorite discoveries: their collection for next season consists of a mostly black and navy, while keeping it interesting by mixing a lot of textures and materials (croco and suede being my favorites). Their online shop is not open yet, but you can find their selling points here. Architects Caroline Das and Kim Nivelle are the brains behind the jewelry brand DAMN. Inspired by optical illusions and distorted perspectives, they designed a 3D-printed collection that turns 2D drawings into 3D objects and the other way around. In the Sorbet Seams webshop, you can find these The Good Machinery bracelets. They’re a little too out there for my personal taste, but I love how much they remind me of paintings, and the fact that they are made of recycled asphalt. As you maybe noticed I find the ecological and fair trade aspect behind a brand very important, so I can only applaud this creative and ecofriendly use of material! Without a doubt, you’ve heard of talented Ellen Kegels and her knit collections LN Beanies, knit by Belgian grannies, and LN Andes, knit by young Peruvian mothers. I’ve written about LN Andes before and I’m still as much of a fan as a year ago. The knits are incredibly soft, super pretty, come in gorgeous colors (you can see next season’s colors in the photo) and by buying one, you’re giving young women the opportunity to work in humane conditions. It’s a win-win, right? Unfortunately it’s a little pricey for a student like me, but I know where I’ll be spending my hard-earned cash as soon as I start working. Hanne Schoofs is a jewelry designer who takes her inspiration from the ordinary, as her trademark button jewelry shows very well. My favorites was this tiny ring, both rough and delicate at the same time and available in gilded silver, rose, white and yellow gold. Would be the perfect addition to my collection of delicate jewelry! Scotch and Soda always works with the prettiest prints and most gorgeous fabrics, and next season won’t be different as you can see. There’s a printed pink coat I’ve been dreaming of ever since I first laid eyes on it (but forgot to snap a picture of, sorry!) but the men’s collection made my heart jumps as well, I have to admit. 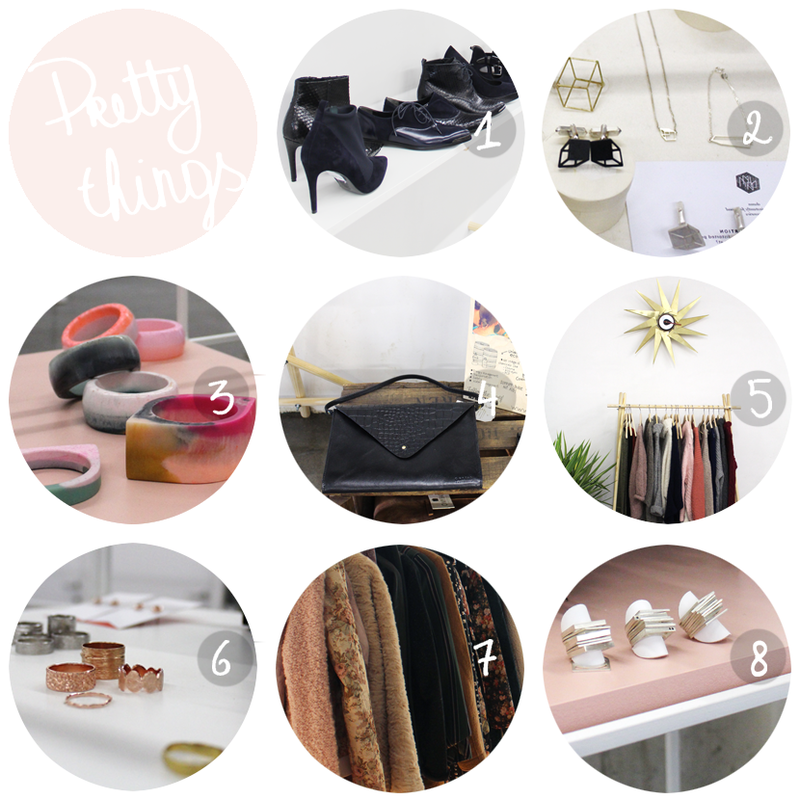 I might have to expand my shopping area a little bit… On another note, the collection was presented at Goldwood, a vintage design shop and art gallery which I loved so much, I might have to devote a whole blogpost to the photos I shot there. Being an architect myself, I can’t but love Lore Van Keer‘s jewelry inspired by architecture and design. Her jewelry is influenced by geometrics and often asymmetrical, which is always a plus in my book. Who needs two identical earrings anyway? Follow me on bloglovin, facebook, instagram, pinterest, flickr and tumblr. Ik heb er lang over moeten nadenken hoe ik hierover kon posten, zonder dat het uit de toon viel met de rest van mijn posts… blij dat het werkt! Thanks for sharing this with us!! now going to take a look! I love all these! Thanks!